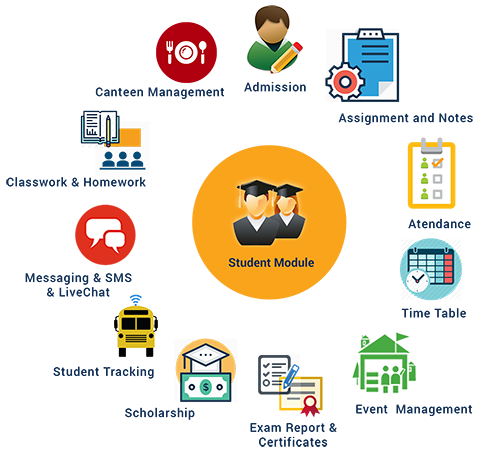 Student Management System is capable to handle considerable amount of big student data and provides accurate information. It is built for the common interest of students, also Teachers and Principal can guide the students in the Process of Registration and their Admissions. Allocating them Class, Section, Tasks, Assignments and Class Notes, to analyse and Assess the Student Performance as well as Teacher's performance in teaching diverse Subjects and Courses, the system is also built with the purpose of tracking Students Daily Attendance and manage their Academics, Tasks, Events, Leaves using the system. Moreover, Students will also learn about new generation technologies with their daily academic activities with simple architecture and easy to understand user interface for students. It is a management system for Helping the Educational Institutes in Establishment and to Manage Student data. Genius Education Management provide capabilities for registering / Enrollment of Students in various courses; results of student exams and other Assessment scores; creating student Schedules and Time-Table, Regular Tracking of Student Attendance, and other student-related data which is essential for the school. Genius Education Management provides Cloud based Online Enrollment and Admission process for the students. The system will help the parents in efficient and smooth flow of registration of their children. The comprehensive Student Registration Process will be managed by admin to handle and streamline the enrollment process for the same, it will provide Online Registration form for the Schools / Colleges / Institutes to achieve the enrollment goals, and boost the student strength of the Institute. The Parents can fill the Online Admission form for the Enrollment process with all the Student's Personal and Academic Information, they need to upload all the academic certificates including school leaving certificate from the previous Institute and photos for photo identification proof. The admin will verify all the uploaded documents with the original copies, mark them as verified and approve the application for the further process, the parents don't have to go to the Institute to pay the fees, but instead they will get the online token to pay the fees through Genius Education management online payment gateway which will enable the fees payment process competent and hassle free. Our interactive Mobile app will provide the convenient access to Student Admission Process Form in iOs and Android Devices which will help in better communication using email and SMS notifications, this will Maximize and Control the Enrollment of the Students. Thus, its main aim is to Save time and 30% admin cost of the Institutes. This module will reduce the manual paperwork and provide the easy and direct access to enrollment forms and data. It will certainly reduce the workload from management and staff members and improves the communication and efficiency. 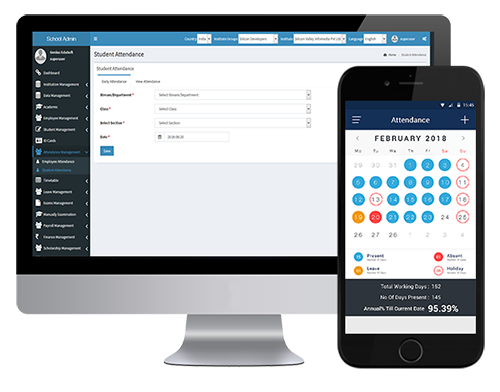 Teachers can create Daily Attendance of the Students through our interactive Mobile App, also they can view weekly, monthly and yearly attendance of their students. Thus, parents can supervise and monitor their children's attendance. Likewise, Students can also view their daily, weekly, monthly and yearly Attendance. Teachers can View the Attendance of Each and Every Students by class, section, month or year wise through different Stream / Department. This feature will Show the List of all the Enrolled Students in the Institute. The admin can add all the details of the new students like : registration number, roll number, first name, contact number and image. 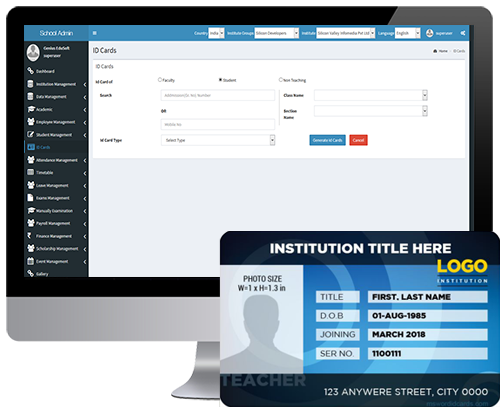 Genius Education management provides the feature of Online Generation of ID Cards, after completing all the enrollment process the admin can create the student ID cards by adding all the details like : Admission number, contact number, class and section. The system will auto generate the ID cards for the individuals. It is helpful in Tracking and Monitoring the Records for Every User with Unique Id and Password for members. 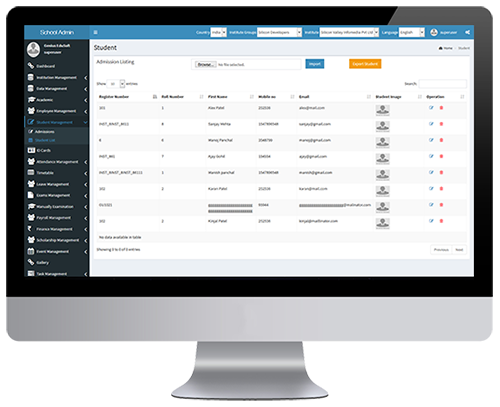 Also it can manage tasks, leaves, events at single platform.